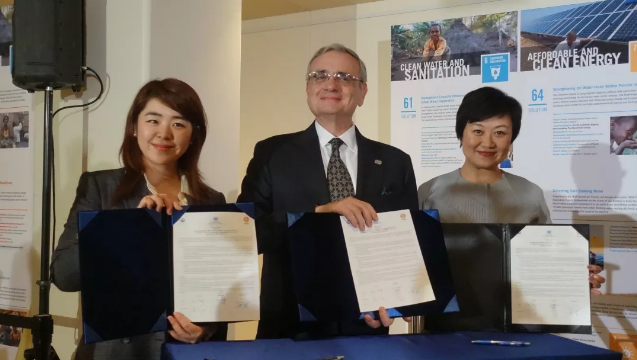 The Finance Center for South-South Cooperation (FCSSC) and the United Nations Office for South-South Cooperation (UNOSSC) and Phoenix Satellite Television (from now on “Phoenix TV”) signed a tripartite agreement at the South-South Development Expo in New York on November 28, 2018. The three parties will work together in the framework, research, writing and production of the “Report on China and South-South Cooperation” and case collection project. At the same time, keep pursuing the discussion and raising awareness about South-South Cooperation in the world. 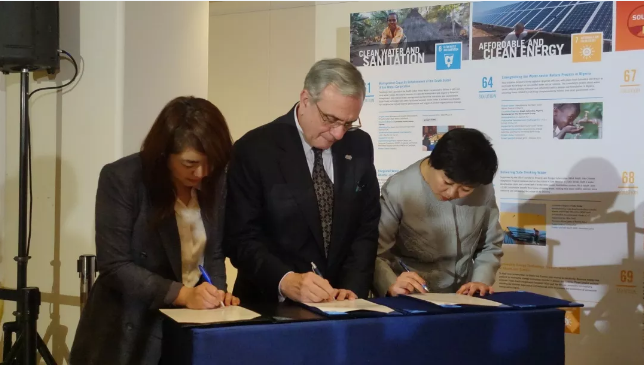 Envoy of the Secretary-General on South-South Cooperation, Jorge Chediek, Executive Director of the Chinese Channel of Phoenix Satellite TV Gao Yan, and Deputy Director-General of the Finance Center for South-South Cooperation Zhang Jirong attended the signing ceremony. The partnerships expect to become a platform to provide a comprehensive service for South-South Cooperation, strengthen capacity and experience sharing, and jointly promote the global sustainable development process.